This item is not available for purchase online. Please call (613) 372-1972 to order. The BERNINA 570 Quilter's Edition with Embroidery is the quilter's dream model of the revamped BERNINA 5-Series launched in 2017. 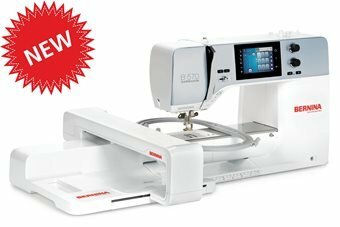 The new BERNINA 570 QEE features more throat space + jumbo bobbin + dual feed + countless other features including embroidery. We are currently taking pre-orders on this and the other new 5-series machines. This collection of machines will definitely be best-sellers for years to come. These are just a few of the features that make the BERNINA 570 QEE stand out among the competition. The BERNINA 570 QEE is an intuitive and easy to use sewing + embroidery machine. If you love creating things with no limits, this is a great machine for you.